Fruit Ninja – Fruit Carnage! 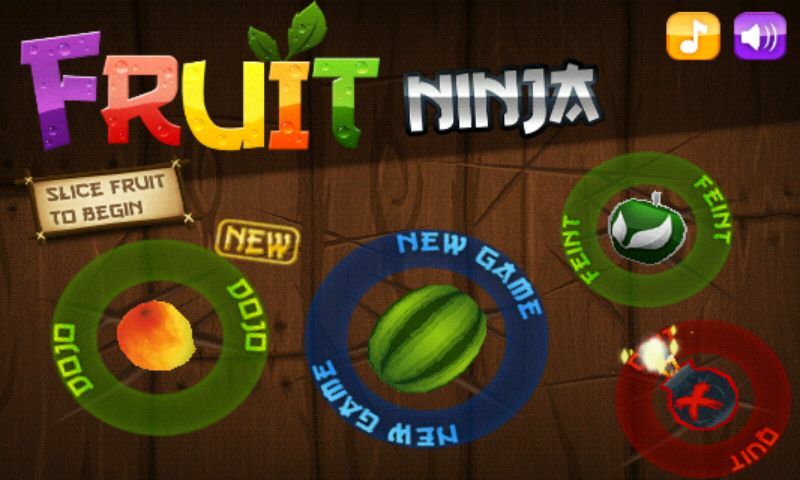 We’re on a roll with presenting blockbuster hit games these past weeks – and today its Fruit Ninja time. Unless you’ve been living under a rock you will have heard of it, provided you are a gaming fan, of course. The proof is in the pudding, or in this case in the fruit salad. 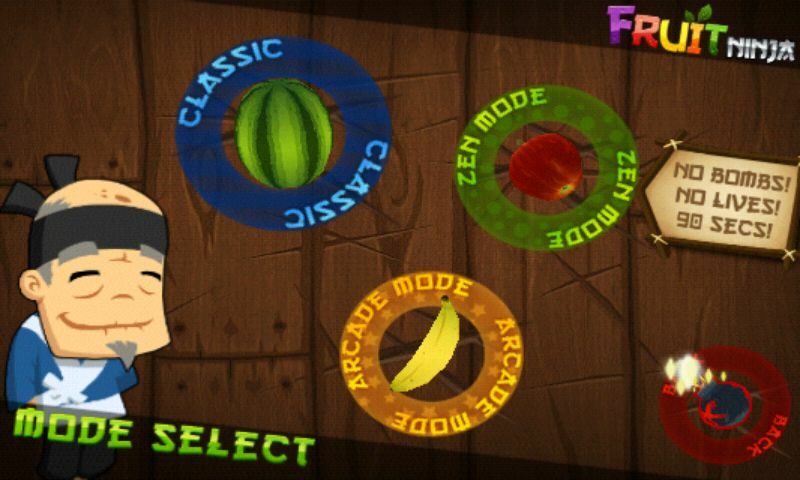 Fruit Ninja has been downloaded 250 000 times already (for Android and iOS). Fruit Ninja's UI bodes well for what the game has in store for us: it's adorned with lots of fun animations. The main screen harbours an option for setting the volume as well as four fields that you select by chopping the fruit: there’s New Game, Dojo, Feint and Quit. Hit New Game in order to start a new round as well as select which mode you’d like to play: choose between Classic, Zen Mode and Arcade Mode. In Classic Mode you have to slash, slice and chop up fruit using the touchscreen and your trusty old fingers. Just be sure not to accidentally chop up a bomb or let more than two fruit slip by unharmed, unless you want to game to be over. You score points every time you slice up a fruit, and extra point for successfully chopping up particular fruit combinations. Should you not want to have to deal with flying bombs or lives that are running out give Zen Mode a spin. This mode is all about scoring as many points as possible within a 90 second time frame. When playing the Arcade Mode you have 60 seconds to chop the goods, and, again, mind the bombs. Some of the fruit are special: for instance, some will trigger a Freeze mode which slows everthing down for s short while, making the fruit slicing easier. Certain fruit combinations will also score you more points. The three modes are all great and guarantee variety. Hit Dojo in order to access the Sensei’s Swag, which are basically game trophies. You will receive swords whenever you’ve accomplished certain feats, such as chop 40 bananas. Fruit Ninja is easy breezy, but so much fun and the perfect kind of game for those in-between moments. The different game modes help kill boredom and you can boast your high scores via OpenFeint. No explanations are provided, meaning that users are left to research what certain swords or game modes can do by themselves—but that’s why we’re providing you with today’s review. Quite a few things have changed in the Fruit Ninja universe since we tested the 1.5.4 version of the app for you. In the current 1.7.6 version the bugs have been fixed and there are are lots of fun new rewards to be earned (new swords, new backgrounds, etc.). There are even new fruit that have been thrown into this juicy mix (for instance pomegranates, which tend to explode if you slash away at them long enough, and will wipe out everything else on the screen). Due to the game's popularity, a fruit store is now also available. This is where you can purchase Fruit Ninja fan articles to your heart's content. Furthermore, you can now share your score with the world and check out how others are doing via OpenFeint. The final new feature (and the one I like best) is the option to have an online match with one of your friends. This is where you really put your Ninja / fruit salad skills to the test. You will then be redirected to Google Play. Hit the the 'Open' button. Don't worry, you won't be asked to repurchase the application! The application will run without problems from now on. We apologise for these set backs and are working on sorting out the issue. Controls for this application are relatively simple and intuitive—after all, you’re chopping fruit and not performing brain surgery. Fruit Ninja’s design is really nice made: the game is absolutely delicious. 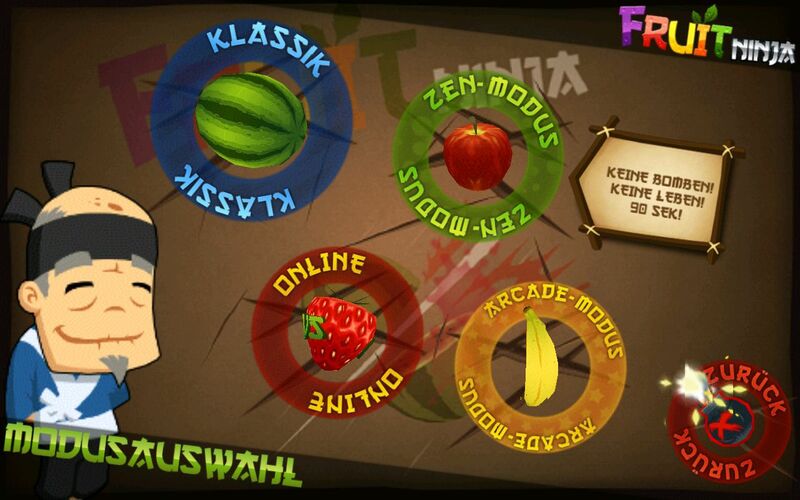 An extra application – Fruit Ninja THD Free – is available for optimised tablet use. Fruit Ninja runs very smoothly—we even tested it on the Desire, just to make sure it was up to par on slightly older devices, and it did beautifully. 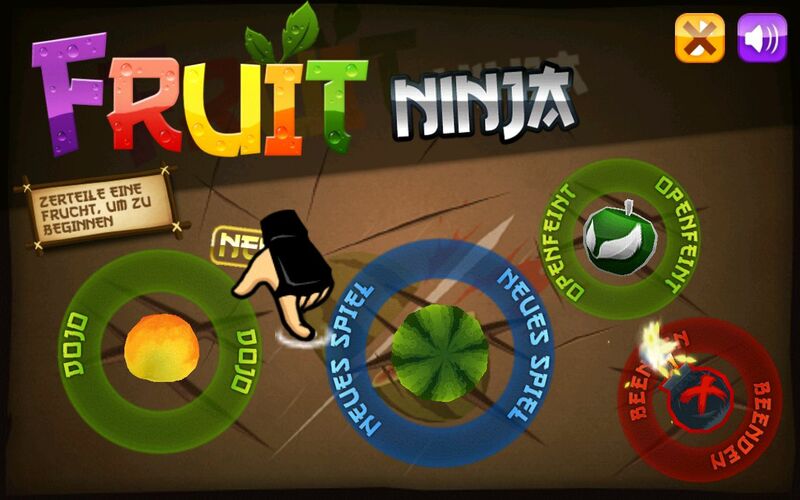 Fruit Ninja is available for EUR0,89 from the Android Market. A decent price if you consider how well this application is made. 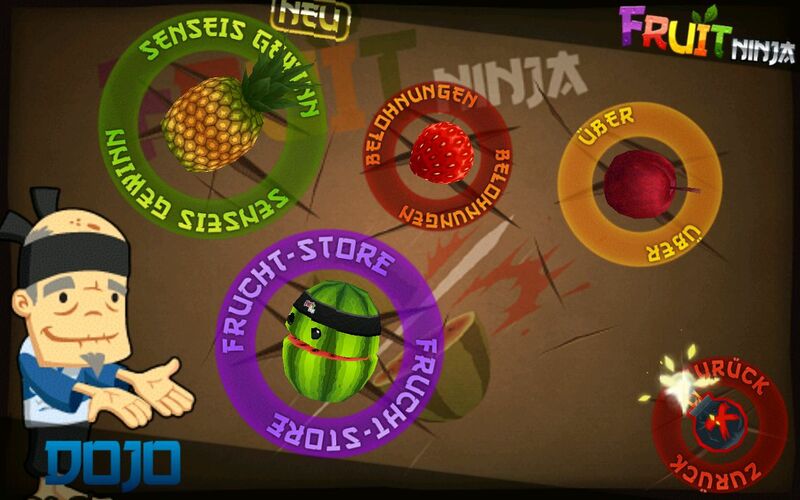 Stop press: As our app of the week, Fruit Ninja is available for only EUR 0,49. Sorry to hear you're having issues with the app and your Lexibook. We recommend getting in touch with the app's developers via their website, perhaps someone can help you there. my son loves this game so I relised I could get it for his lexi book but it always says this application has stopped isnt working right now. so he can't even play it iv even payed for full version which is still the same I have just msde it in time for refund think I'll sell his lexi book for ipod so folks avoid the LEXI BOOK NOT WORTH THE £159 !!! Sorry to hear that neither of you liked it! You know that there is a 24 hour return policy when you purchase apps via the AndroidPIT App Center, right? The money is then wired back to your account and can be used to purchase other applications.